Indscribe's Blog: News and Views about Indian Muslims: Can Indians, Muslims forget Gujarat riots, get over the 2002 communal carnage? Can Indians, Muslims forget Gujarat riots, get over the 2002 communal carnage? BJP President Rajnath Singh recently made an appeal to Indian Muslims, asking them to forget [or ignore] the 2002 post-Godhra riots. I have a few things to say on this issue. You can read the ten points below. But first: it's not an issue for Indian Muslims alone. Innumerable non-Muslims are fighting to get justice for the victims. The question of forgetting and forgiving is really strange. We all know that Time is a great healer. Many among Muslims also may wish to forget and forgive at some point of time. Others may not. Naturally, those who suffered [either Hindus or Muslims] can't forget easily. The criminal cases are in courts. However, for electoral gains, it is expected that Muslims must shed their anger against BJP. If you remember, in the decade of 90s, sections of Muslims were getting fed up of Congress and were seeing BJP as an alternative just when 2002 riots took place. They voted en bloc against BJP in next Lok Sabha elections. People ask about the difference between Gujarat riots and all other riots or massacres in the past. I haven't forgotten the role of administration in Maharashtra when Sudhakar Rao Naik was the Chief Minister and Mumbai saw the worst communal conflagration in 1992-93 under Congress rule. I haven't forgotten Moradabad riots of 1983 or the 1969 Ahmedabad riots about which we heard from early age. Neilly, Hashimpura-Maliana, Jamshedpur and Surat are all recalled still by victims or those who witnessed them. Muslims don't have any pathological hate for BJP. Elsewhere, in other states, they have voted for BJP candidates. In MP and Chhattisgarh, Muslim majority areas have seen voting for the BJP candidates, in different elections. Who would want to be eternally facing the might of the state in any region! It's quite easy to say that we forgot, then join them and make them happy in order to enjoy 'fruits of development'. After all, how many idealists or fighters are there in our society? Don't we all make compromises in our lives all the time. But still, people are not forgetting, not ready to just say that "we have moved on". The wounds are too deep, too painful. Why? Gujarat 2002 changed everything. Not other riots but 2002. You know why? It was the first televised riot unlike Neilly or Hashimpura. In those incidents, it took months for people elsewhere to realise extent of the killings. Here, the hate was seen, felt and state's absence was visible. Raj Dharma was not followed. It was clear, deliberate. 1. Even if everything that happened during riots is forgotten and it is accepted that it was an aberration or sudden failure of administration in anticipating and containing the outburst of anger, did we see any effort to reach out to victims after the riots? We hear a lot of need for reconciliation. But for years, even after 2002, we saw just plain hatred. No sorrow, all Shaurya. We remember Chief Minister's statement about Muslim women, four years after the riots. The entire election campaign after riots rode over 'Ham Panch-Hamare Pachchees' slogan. 2. There have been major riots in India in the past. But the politicians, at least, appeared solemn, saddened and sympathetic. They visited the riot-affected areas or at least did the lip service. What else we expect from our politicians? Not much, at least, a few kind words. Here there was none. The administration didn't come to the succour of the victims. 3. Today we get lectured about inclusive development and are told how State government in Gujarat is concerned about the progress and protection of all its citizens. But where was the concern after riots? Do you remember any BJP leader visiting the relief camps? Who provided or offered any help whatsoever to survivors! 4. Perhaps, a lot might have been forgotten had Narendra Modi just placed his hand on the head of an orphan of the Ahmedabad riots. Had he just embraced a child, shown a little affection or concern and wiped his tear, perhaps, we could have believed a lot about administrative failure and BJP's intent. 5. 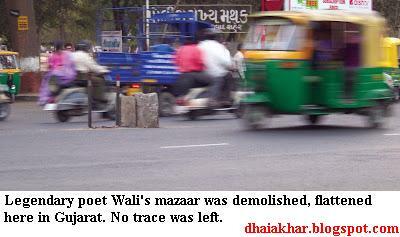 Of all the mosques and religious structures that were demolished, there was also the tomb of the legendary Urdu poet Wali [Wali Gujarati] also known as Wali Dakani--the Urdu poet who loved Gujarat and sang paeans of it. Was there even a word about restoring or reconstructing the mazaar? 6. People have grievances against their leaders and governments. They may or may not act on our demands but at least they should listen. Here, there was nothing. Just cold silence. No empathy, no healing touch was visible for the next 7-8 years. Isn't the anti-Sikh rmassacre in Delhi still an issue, more than a quarter century later? Aren't the politicians named by victims finding it tough even today? 7. Now that pan-Indian acceptability is needed and the BJP wants to form a government at the centre and needs allies in other states, Muslims are asked to forget 2002. It's not a Muslim-only issue. Muslims even didn't know how to fight this battle to secure justice. It is the large number of Hindus who are putting their lives to discomfort, fighting this battle and most of them will continue to do so. Are they ready to forgive? I have already written about this great untold story of secular India, on this blog. It is this reason that India remains India. 8. If there is injustice you should accept it or take measures to correct that. Even today, we don't hear any remorse for what happened over a decade ago. Congress said Sorry for Sikh riots, BJP can't do the same. By the way, there is no reason to ask someone to say it, if they don't really mean it. 9. Frankly, I don't think the issue is as simple as it is made out. Its not Muslim Vs BJP or Muslim Vs Modi. Its about Justice Vs Injustice, Hate Vs Harmony and Atrocities Vs Penance. People who urge riot victims to forget, conveniently ignore that they recall 1526 AD and 1000 AD, at the drop of hat. If not they, their followers do it regularly. Even today, running businesses or earning livelihood is not easy for Muslims in the state.There are a host of other issues on the ground. Please try to do something and then ask to move on. 10. Ours is a democracy. Gujarat Chief Minister Narendra Modi has a strong constituency, a large number of supporters, and he may lead the party to a massive win. He has definitely managed to create an image for himself. I don't discount the possibility, even if remote, of him even becoming Prime Minister. No one can stop that if the electorate in this country would really want him at the helm. There is no need to talk about forgetting or forgiving, but the BJP leaders haven't come out to be large-hearted. Also, they haven't shown the ability to be inclusive which is required from great leadership that really intends to move on or wish the citizen to do so.